Print out the below tools to help build your income with our company. 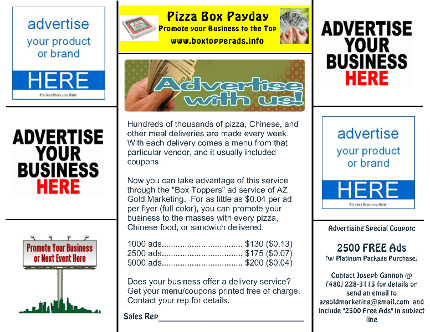 Every flyer that gets passed out gets more exposure to our affordable advertising program and special promotions to help others achieve financial independence and freedom. New flyers will always be added as they are created. Simply print them out and write your name on them, and then pass them out to the masses. Sign up for your FREE IBOtoolbox account and stay connected to the business. Learn about other new programs also you can get involved in to make additional income streams, but you will also be able to stay connected to the administrator of the AZ Gold Marketing programs. Click on the banner below to sign up for FREE.